What is the alien symbol? 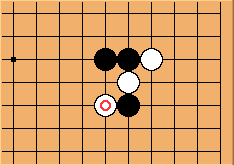 See Learn to Play Go: Volume IV: Battle Strategies by Janice Kim and Jeong Soo-hyun pp. 95-7.
and may, or may not, have been sighted in numerous crop circles. The marked stone is often useful in capturing stones, or otherwise disrupting Black by preventing a bamboo joint.